As you know, here at Bandicoot we don’t much like to blow our own trumpet. Oh well, go on then, if we must; we feel like we deserve it, what with it being Christmas and all! And this year really has been fantastic for Bandicoot. Busy, yes, but of course that isn’t a bad thing when you’re a growing business and have a family to feed! So here is our end-of-year summary of what we have been up to, what we will be doing next year and a personal message for you, our loyal customers. When we say 2017 has been busy, we’re not kidding! The last 12 months have seen us continue to support our clients with dedicated IT services, which a lot of the time involved us rescuing them when their computers crashed and – yes, you’ve guessed it – they hadn’t backed their data or work up! If you make one New Year’s resolution this year, please, promise that you will back up your data in 2018!!! Our other big news is that we became a Sage Partner this year, which has been fantastic in terms of the resources available to us and our clients. We’re especially proud as we’re actually the only Sage Partner based in Burnley, so, if you have a small to medium business in Burnley, we are your natural choice for all your Sage Line 50 Accounts and Payroll support. On the web design front, in addition to working on loads of WordPress website builds this year for some great and diverse clients, we have also done quite a bit in the eCommerce website design line too. One of our favourite such websites is the one we built for Civil Engineering and Construction Ltd (CIVENCO). This local construction service provider is based in the Rossendale Valley, but they work on some huge projects all across the UK. We really like the clean colour palette used on this website and the simple navigation. We also tinkered with our own website this year, adding a knowledge base section, which we hope to carry on growing in the future. We love the idea of making our customers self-sufficient in simple IT tasks and are looking forward to getting down to some content creation, so do please let us know if there are any particular topics you would like to see added to our knowledge bank next year! Of course, this year wasn’t all work, work, work! We’re very much a family business, and as a family we walked Scarlett’s Stride back in October. We have a strong commitment to our local community, not just as a business, but as a family too – we don’t just work here, we’re from here too – so we’re looking forward to continuing our community work and family activities next year. We also grew the extended Bandicoot family this year by taking on two new junior IT technicians, who’ve both settled in remarkably well and are producing excellent work and helping the entire team to do more and do better. Cyber Essentials was launched back in 2014 but, with online threats becoming more common, 2017 seems to have been the year in which a lot more businesses finally sat up and listened. It was also the year we launched our own Cyber Essentials service, helping businesses prepare for and achieve the Cyber Essentials certification themselves. As mentioned back in August; it’s now not enough to just feel like your cyber security is fine, or even to be confident in your own processes and systems; 2017 was the year it became important to be seen to be so, and to have the credentials to back it up too. As digital crime grows, Cyber Essentials will continue to be relevant in 2018, and we’re looking forward to helping even more businesses achieve that all important online security. Related to Cyber Essentials, GDPR and the changes it will bring to your business has undoubtedly been the hot topic of the year. Although the new rules don’t come into play until May next year, it became apparent early this year that some businesses would need to do a huge amount of preparation in order to be ready for the deadline. The consequences of not preparing? Potentially huge fines, which is why GDPR will continue to be a biggie for us and our clients through 2018. After such a great 2017, we’re all set to hit the ground running in 2018 and continue with much of the same, but more! Obviously GDPR will continue to be a huge topic right after the Christmas holidays and we urge any businesses who are still hoping that it will just go away to pick up the reigns when you’re back in the office and get in touch with us. Creating good looking but functioning websites will always be one of our core services, so we’re looking forward to continuing to work with Lancashire’s SME businesses and building awesome websites for them! You can take a look at some of the projects we have worked on this year here. Something else we’re keen to continue with in 2018 is helping the local Burnley economy. Although we work with clients from all over the UK, the majority of our business comes from the community in which we are based and we understand the value of local businesses. We’ve helped businesses of all sizes in Burnley this year by providing essential IT support, building and designing websites, and helping with their communications and infrastructure. We’d like to assure the Rossendale Valley business community that Bandicoot are raring to go in 2018 and will continue to be here for any of your IT requirements, whatever they are. Who knows, we may even be looking to employ another local future IT professional in 2018 too! Our small but mighty company has really grown lately and we will soon need more hands on deck if we want to ensure we deliver the exceptional customer service that our clients deserve. Finally, and most importantly we’d like to thank each and every one of our customers for your continued support this year. We’ve had a cracking year, and hope you have too. 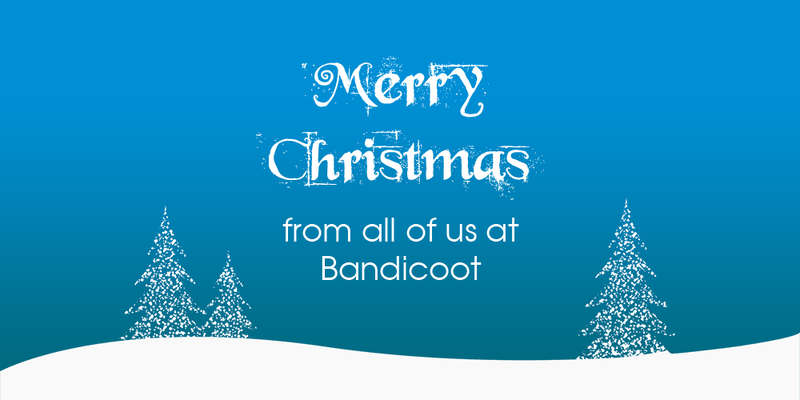 Mr Bandicoot (MD Stuart) and the rest of the team send you all well wishes for a happy Christmas and a prosperous New Year. Remember not to go too heavy on the mice pies, and we will see you back here in January 2018! How Do I Keep My Computers Safe Over The Christmas Holidays?